Google Book Search lets you download books, but only if they're in public domain, like Hamlet. All the other books are available as a limited preview or as a snippet view in Google Book Search. IMO, this violates the spirit of fair use. I loathe current copyright and patent law (this is no place for a philosophical discussion), but the law is THE LAW, a contract is A CONTRACT, and a license is A LICENSE. Google has had to fight and finagle to obtain the right to provide us with this fantastic book searching service. Don't encourage people to abuse the system, giving Google every reason to cripple, if not kill, this service. The LAW is different place to place, so Google should stop giving its services on unknown places. Linux alternative for downloading Google Books? Anon: Did I miss something here? Where does it state that Google is helping or allowing you to violate the law by downloading protected work and thus put themselves or their service in jeopardy? It specifically states you can only download works in the public domain. "or you could automatize the process using a download manager": Ionut, could you please explain? Thanks. BOOK_ID can be obtain directly from Book Search, while SIGNATURE can be obtained from the source code (search for &sig=). I'm not sure tools are very good at determining fair use, Anonymous, because fair use is determined by the specific case. No contract can stand above fair use laws, rather, fair use laws specifically provide exceptions for everyone that go *beyond* the contract. Your contract may say "you may never use this paragraph of text!" but fair use may say, "yes, in certain contexts -- like a book-length discussion of the subject related to the topic -- you may well use it, nevermind what the author says." I wrote a complete guide for downloading books using this tool yesterday. Regarding copyright and licensing issues, tools like this don't necessarily break the law per se, but they can make it easier for people to use content illegally. When Google Books lets you preview books but not download them, it's also impossible to highlight and copy text out of them (unlike the public domain books). But when they're saved into a PDF, you can often highlight the text in the PDF file ... and then copy and paste to your heart's content. While this may be good news to plagiarizers and essay purchasers, it's bad news to authors like me who make a meager living from what I publish -- and then resell to other publications because I own the copyright. When my writing appears all over the internet, though, it's no longer worth anything. I don't mean to go down the ethical rat hole with this one -- I really just mean to point out that tools like this aren't bad themselves, but they can make it easier for people to do bad things. This is less about "legal or not" in various jurisdictions. It's about using or misusing a service. Google has still a hard time convincing publishers to submit their books to GBS, and publishers have a hard time to convince their authors. Now some wisecrack with too much time at his/her hands comes up and spoils the fragile balance. Tools like this will scare the publishers. Publishers will pull off the books from GBS. End of story. Another missed opportunity. If you need the book and are too cheap to pay for it, search it on Piratebay. Leave Google Book Search alone. Google will probably force this to be taken down. There was a similar program a couple years ago, and they did the same thing. It seems like a lot of effort to get an incomplete something for free. The Public Library is still available and they have a lot of books, and media that you can borrow for free, without worrying about licensing and fair use laws. "Automatize"? (I suddenly feel like I'm watching a B-movie from the 50s.) On topic now: I think most of the works in question are already available via Project Gutenberg (and certain other ebook sites). It still very hard to find books for free on the internet. Books are very expensive at where I live and the local Library isn't that complete. I try to find books at google books but it's incomplete. Some pages are missing. it doesn`t violate anything.in fact, with the print screen button u can also have an image of that books. Some of the commenters don't understand what is going on here. 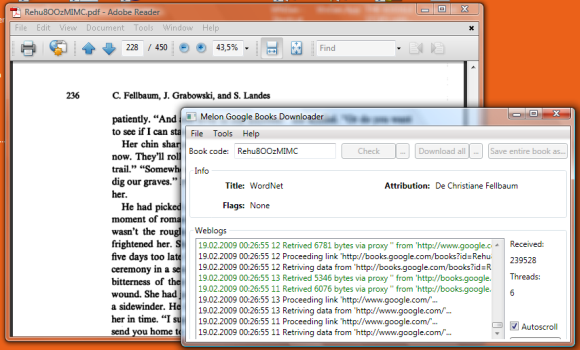 Google Books permits the downloading of book pages that are already in the public domain - and only those books. This is not in dispute, nor is it a question or fair use or piracy. These are books that, because of their age and status, no one owns the rights to. Think of, for instance, the works of Shakespeare. CURL method doesn'w work for me. I used the correct parameters, but i get "
Your client does not have permission to the requested URL"
i think you must provide us(people who can not buy these books)the way to find the books we want.it is not money the reason why we can't have these books but the libraries,the reading rooms.i live in albania,in a small town.i know it is not your fault,but please,come on,internet is the only chance. i (and my people)would really appreciate your help. rules are made by men, if this is true then who writes the law and who does it serve, to be fair intellectual property belongs to those who created that asset and should be given something for it, but price is generated artificially and in reality money is just an abstraction that represents debt, some can afford to pay quoted prices and others cannot, i would not deny somebody that is starving a free meal, nor could i condemn a starving man for stealing any food, but if you are greedy then thats not good and wont do at all so judge for your self and use your own discretion so that no one loses out, and don't be brainwashed by convention. I agree with the guy above. If you can buy the book plz doo so. If you are poor or for some reason can't get some particular book use the downloader but don't abuse it. I don't think that you are breaking the law if you download these books because, they are all in the Public Domain. That is the reason why they have those and not all books up. There is some information regarding what types of books are offered by google and which books can be downloaded with GBD. This will spice up discussion. All those scientific works are written by university professors who get, in Germany, 10,000 dollars... not a month, but 14 times a year... not up to their 65 years, but in Germany, up to their death ( and from then on, their widow gets about 70 p.c. of that up to her death ). They write those books in the time they are paid by the taxpayer. And then, they go to scientific publishers who sell 1 copy of 120 pages for 100 dollars if not 150. You see the system is rotten and ridiculous, and Google is breaking it up a little bit, and that's a good thing. I think copyright laws are way too long now 75yrs for older books while new one are 120yrs now. Besides that many of these books are out of print and almost impossible to buy unless you can find them used or in a library, in which case the writers get nothing. The media industry is setup to maximum making money, the artist and writers in most cases make little of the profits, unless they have good lawyers and control the copyrights. In some countries its legal to download copyrighted material since they pay a yearly tax to do this. Copyright laws need to change to allow internet libraries, with a year fee for that right but that could allow writers and media creators to by past the larger companies or maybe something like itunes for books. Printing companies days maybe numbered if online books catch on, with text books for schools and colleges their land money maker. Where countries its legal to download copyrighted material since they pay a yearly tax to do this?Really. The problem I see as there are a lot of books on google prior to 1923 that are public domain but are listed as copyrighted material and can not be downloaded. What is up with that? the program doesn't work with linux.. and the sistem with URL codes is lacking in some parts.. in my URL's google book there's not a "sig="
You mentioned "BOOK_ID can be obtain directly from Book Search, while SIGNATURE can be obtained from the source code (search for &sig=)." Actually I came through your blog searching for any explanation of this code, it is not constant for the same book !! Which means there's no way you can make a list of links to be downloaded by any download manager as the SIG varies from picture to another ! So did you find a way to resolve this ?? Apparently, Google now uses different signatures for each page and the software mentioned in the post is no longer available at CodePlex. i want to download a book on cell and microbiology of gerald karp......it costs 7000/-. how can i download on mi pc????? any idea guys? I would happily pay for ebooks if there were more of them available. Academic texts are almost never available online, and they're usually rare and expensive in print. Online is a much more sensible format for something like that. WTF academia? If you want to download books just use library.nu, much better than this. Try it, if you need E-Books From Google. ► Enjoy your newly full registered app ! ATTENTION !!! ATTENTION !!! THIS SOFTWARE HAS VIRUS , DO NOT DOWNLOAD !!! Great article, It is best article and I appreciate this article, I am thankful to you for sharing such a nice article.